A quick close up of my desk today. Hello my people! How are you? Once again the week flew by, vacation is over and the boys are back in school. So back to work for me. I have been saying I need to work on my coloring more but when I look back at my last few WOYWW posts, I realize I actually am coloring. Today I was playing around with some Easter images and practicing adding grasses, grounds and sky to my images. It is official, I need another Copic case. I have filled the little one I have and sitting with the decision of whether I buy another 72-pen case or go for the gusto and buy the big one. 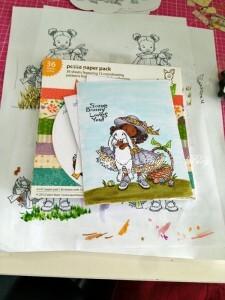 My dilema is that I like this size when I go to crops, It fits nice on my work table without taking so much space but I know I will continue buying markers so I better figure it out. I am open to any thoughts. Practicing techniques on some of my Easter images. 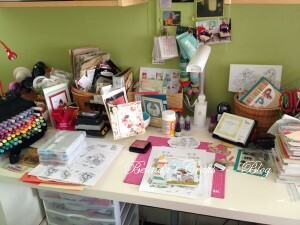 Scrappymo asked me last week for a wider shot of my desk. So I held breath and stepped back today so you can see a little more of my craft room. Wide angle of my craft room today. Yes, my favorite color is green hence the wall color. I love my desk. I bought it because it has such a large work surface. Ask me when is the last time I saw all that surface. Take a look and you have your answer! I also completed a card for a contest but just missed the deadline. You can see it here in another post. Well I have some appointments in the morning but plan on snooping around the globe at your desks in the evening and over the next few days. 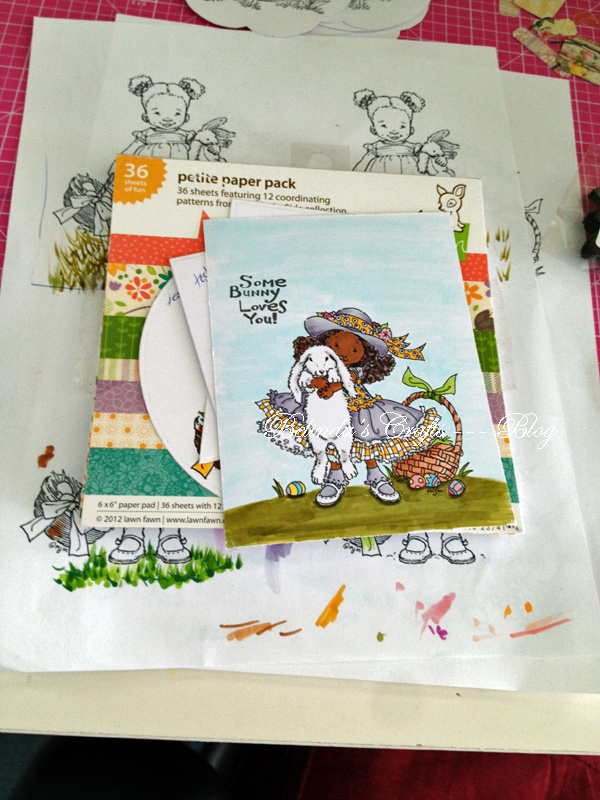 Previous PostFairy Time – New card! 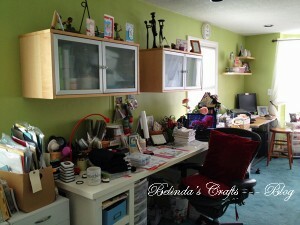 Green is my favoutire colour too, although my craft room isn’t painted at all, I was in too much or a hurry to move in and now I regret that!! Pretty images, I will admit to rarely adding sky or grass, but it do do a few lines for grounding purposes! *Makes that “I do a few lines”, lol! Do, do! Hi Belinda, very envious of your desk – mine is rather cramped in comparison!